Choosing the right blood glucose meter varies as different meters tend to appeal to different people; children, working adults, elderly people and those with disabilities. Your job, hobbies, activities and personal preferences can all affect what you want in a blood glucose meter. If you are a mutiple daily injecter and test your blood sugar several times a day, say 4 or more times daily , you may have different requirements than for people who test twice a day or less. If you test your blood sugars through the day, features such as a fairly large result memory (over 200 results), the ability to add notes and software to download the results may be particularly useful. For less frequent testers, or for those who have to buy their own test strips, the cost of test strips used by the meter may be one of your main considerations. It may be worth asking your pharmacy how the price of test strips can vary. If so, make sure you base comparisons on the same number of strips as some manufacturers may sell their strips in different quantities. You can buy your test strips online, which may be cheaper than your pharmacy’s prices. Some meters are better than others for older people. Features to look for are large result displays, large, easy to press buttons and easy to use menu options. Look out for meters which only require a small blood sample size. A sample size of 1 to 1.5 microlitres is considered fairly small. Some meters available have been developed to be easier to use for people with certain conditions such as arthritis and sight difficulties. The CareSens N meter has a large screen and a number of features to make it easier to handle and easier to obtain a successful test. The Clever Chek meter is innovative in that it talks you through the blood test which can be beneficial for people who have diabetic retinopathy or are visually impaired. Good features for children include a bright appearance, easy to press buttons and a decent sized display of figures. Parents may look for features such as averages, charts and/or software to help analyse the results. 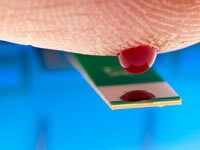 Picking a meter that requires only a small blood sample will help to take away the pain of having to re-prick fingers. Look for a blood sample size of less than 1.5 microlitres. Bayer’s Didget blood glucose meter has been designed specifically for use by children. The appearance of the meter can be particularly an issue for teenagers and younger adults. Some may want a bright appearance whereas others may look for a meter that looks as little like a meter as possible. The UltraEasy meter from OneTouch is one of the better looking meters available and the Contour USB from Bayer does a good job of not looking so obviously like a glucose meter. Size and mobility is an advantage in this age group. A meter that can be packaged away, with all its kit, into a pocket is an advantage. Meters with software and/or on screen charts will be very useful too. Those with an active or fast paced lifestyle may appreciate a meter that fits in with their lifestyle. Small meters may be particularly helpful and nowadays there are also all-in-one meters available.